So far, we hadn’t really been thinking too much about the timings of anything, but this morning we got conscious of the fact that we now had just three nights left, and we had to get all the way from the south-east side of Los Angeles to San Francisco, and neither of us fancied trying to do this in a short time. Anyway, we had the whole of the California coast to travel along. However, I think we had both decided now that we would spend the whole of the remaining time traveling back, rather than trying to do any more exploration into National Parks or other scenic areas. So we spent some time at breakfast confirming our plans, and setting targets. We agreed that our objective for this day was to set ourselves a base for spending that last two days going up the California coast on the way home. So we targeted Ventura as an overnight stay. Now, to those of you who have been to Los Angeles and like it, this may seem as if we were skipping through one of the best parts of America, if not the best. Doubtless Los Angeles does have plenty to offer, but we decided that we a) didn’t have enough time to do it justice and b) weren’t that interested in the tinseltown and theme park aspects of the city. Once you take away those parts, it’s just a big city, so we decided to limit ourselves to driving through the place. We headed off from Twentynine Palms and followed Highway 62 west all the way round to where it joins I-10. We got out the Rand McNally detail map of Los Angeles and Orange County, and tried to identify the best freeway route through the city up to Ventura. It was the middle of the morning, so we were hoping that the traffic wasn’t going to be too heavy. So our experience of Los Angeles was roughly as follows. Firstly, if you include all the suburbs and satellites, it is very, very big. Probably a hundred or so miles from the eastern satellites along I-10 to the western satellites like Thousand Oaks. It took a long time to drive through, even though we were moving at a reasonable speed the whole time. Secondly, there are a lot of people there, and most of these seem to be trying to get somewhere else. Even though it was mid-morning, we were trolling along a complex series of 3, 4 and even 5 lane highways and the whole time I would describe the traffic as busy. Not heavy, but sufficient that you had to check the mirrors on both sides whenever you want to change lanes. There was no time on the whole drive through where a lane change didn’t involve negotiation. Someone else always has to slow down or speed up to create a gap big enough for you to get in. Thirdly, a lot of the famous bits are signposted, and sometimes visible, from the freeways as you pass through, such as the Hollywood Bowl, Hollywood Boulevard, the Downtown area, and so on. Convenient arrangement – you could almost feel as if you’ve been there without having to stop. However, we did have to stop when we found a particularly packed stretch of freeway through downtown, which had roadworks compounding the already heavy traffic. And finally, the roads themselves. 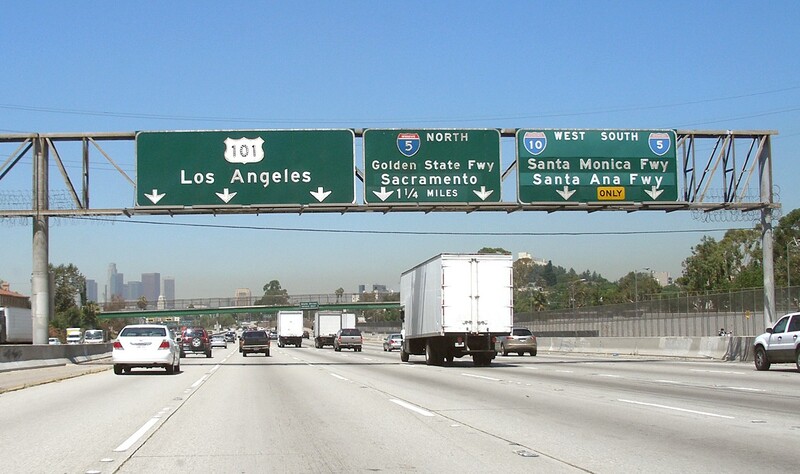 Angelinos have named all of their freeways, but the names don’t always tell you where the road is going. Some of the names also don’t follow the route numbers, so the “Donald Duck Freeway” might be I-10 at one point, and California-15 a few miles up. And many of the numbered routes merge with each other and then split up further on. The names go in pretty much straight lines, but if you want to follow a route number you can find yourself trying to pick up numbers from the signs and making right or left turns at major junctions. I’m glad that we had the Rand McNally Atlas, and that there were two of us. One could watch the signs and shout out lane changes and turns to the other. I think Kas was driving on this stretch, and she did very well to stick to the chosen route, continue at a fair speed and not hit anyone. I really wouldn’t have wanted to do that on my own. We eventually emerged into slightly lighter traffic and decided it was lunchtime. We needed both a fuel stop, and a drink. We pulled off into a shopping mall in Thousand Oaks, I think, and bought hot coffees from a local shop to accompany the sandwiches and Pringles that we had brought ( left over from the Joshua Tree hotel fridge ). Getting back on to the freeway in the correct direction proved challenging, but we got there eventually, and so we progressed on towards Ventura. 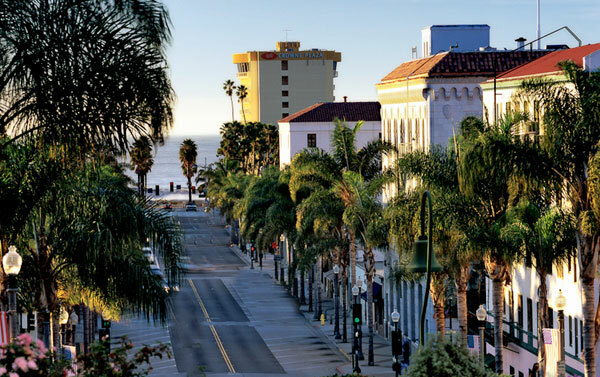 Ventura is a moderate sized town in between LA and Santa Barbara. We decided to stay here partly to see whether there was any quick way to get to the nearby Channel Islands National Park ( www.nps.gov/chis/ ). However, although Ventura is home to the visitor centre, there isn’t much you can do unless you pre-book transport, so we didn’t bother. I doubt we would have had the time to visit anyway, because we were only staying for the one night, and it was already 2pm when we arrived. However, we had decided on the Bella Maggiore Inn as a stop-over for the night based on the write-up in the Moon Guide. This is an old Spanish colonial mansion built around a central courtyard. It was an excellent place, full of character. We got a smallish double room facing in towards the ( now covered ) central courtyard. The room had a balcony view over the courtyard. We decided to have an afternoon of doing very little, so we went up to the local shopping mall and wandered around for a bit. Once you’ve been to one indoor mall you’ve been to them all. It’s a building full of chain stores and little boutiques. It could have been anywhere. Kev got a new watch strap in Sears, but that was about it. Not a very exciting afternoon. When we got back to the Inn we parked up and went for a stroll up the old main street in Ventura to try to identify somewhere for dinner, and to get a nice coffee. It is like my mental picture of a small town America main street, with a selection of 2-3 storey buildings containing a mix of family run shops and restaurants. It’s worth a walk up and down here. We decided that if we ever win the lottery and don’t have to work any more, we might consider Ventura as a place to relocate. For dinner, we decided on a place which did half Thai and half Peruvian. Sounds like a bit of a funny mixture, and so it proved to be. The food was fine, but the atmosphere was a bit strange and it proved to be the first place we’d visited which wouldn’t accept a traveller’s cheque in payment. Every other place we’d tried this was more than happy to treat an Amex Traveller’s Cheque as if it was cash. So we ended up having to pay on a credit card, which left us feeling a bit peeved.